Dan Hurley and several Rhode Island players make their way toward the Rhody Ruckus after the buzzer sounds, with the fans surrounding and cheering for them. Hurley gives a salute to the crowd, showing his appreciation for the 7,959 fans that had their voices booming across the arena the entire game, second most in Ryan Center history. Rhode Island had accomplished something they had not done since Hurley was given the keys to the program: beat Providence College. 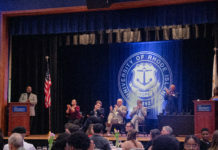 Rhode Island, coming into the game at 4-2, had not been victorious over the Friars in seven years, dating back to when Jim Barron was the coach of the 2009-10 Rams. Providence, coming into the game at 6-1, looked to continue their decade of dominance over the Rams and pick up a quality win over one of the best mid-major programs in college basketball. For Hurley and Ed Cooley, who don’t think of this game as a rivalry, it didn’t take them long to both pick up technical fouls as Hurley picked up his 5:01 into the game while Cooley pick up his with 5:37 remaining in the first half. Emotions were high, the crowd was roaring, and the title of the best basketball team in Rhode Island was at stake once again. Providence jumped out to an 18-13 lead early in the first half, but after that the Friars looked like a deer in headlights and the Rams went on a 17-5 run and maintained a lead they would never lose again. The Rams lead 42-31 at the end of the half, but the Friars got within three as Jalen Lindsey knocked down a three-point shot with 3:49 left in the game. Rhode Island responded with big shots from Jared Terrell, Jarvis Garrett, and three clutch free throws from Daron “Fatts” Russel after drawing contact down the line. A turnover by Jared Terrell to walk-on Friar Tom Planek in the final minute almost jeopardized the Rams, but after Planek missed his free-throw the Rams regained possession and held onto their lead to win 75-68. Free throws and turnovers became the difference maker for both teams. 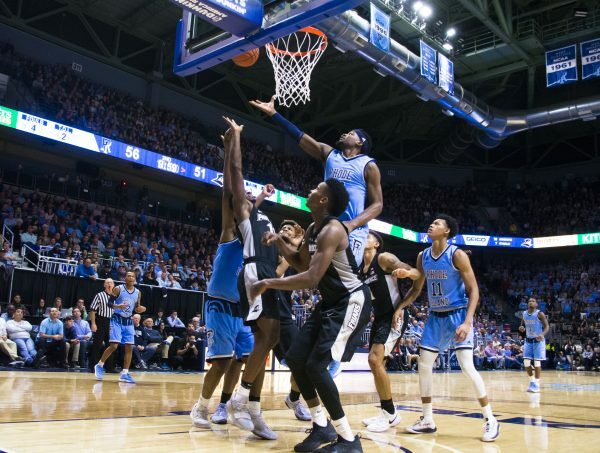 Providence could not convert from the free-throw line and finished 10 of 21, while Rhode Island was 9 of 11 in the second half and 20 of 23 overall. Providence also had more turnovers than a Thanksgiving feast, committing 21 throughout the contest as opposed to Rhode Island’s 11. This greatly benefited Rhode Island as they scored 23 of their 75 points off of the Friar’s turnovers. Cooley attested the turnovers and missed free throws to the hostile environment in the Ryan Center, and had nothing but praise for the Rhode Island faithful that showed up. Hurley thanked the crowd for their effort show up and make the Ryan Center a mad house. Whether he will buy the 7,959 fans a dinner remains up in the air. As for whether or not Russell was enjoying himself in his first rivalry game against the Friars, he was more than inclined to agree. Garrett had himself the best game of his season against the Friars, scoring 15 points while going three of five from beyond the arc while chipping in four assists. Perhaps the main contribution of Garrett’s performance was his defense on Bob Cousy Watchlist recipient and star guard Kyron Cartwright, who last year had a game high 19 points and eight assists against Rhode Island. Garrett held Cartwright to two points on one of seven shooting and forced four turnovers, Cartwright’s worst performance of the season by far. Andre Berry continued to be lethal from mid-range and shot of six of seven from the field good enough for 12 points, while Stanford Robinson hauled in a career high 12 rebounds while grabbing two steals. Jeff Dowtin cracked double digit scoring for consecutive games the first time this year, as he finished with 10 points while also dishing out four assists. Alpha Diallo hauled in 17 points for the Friars before fouling out late in the second half, while Rodney Bullock was held to 10 points on four of 10 shooting. Freshman Makai Ahston-Langford, who’s rivalry with Russell will be a storyline to watch over the years, finished with 12 points before fouling out. Providence shot 55.1 percent from the field, their second highest all year and behind their 62 percent shooting against St. Louis when they prevailed 90-63. The bragging rights in this historic rivalry have been restored to URI. For now, the road to college basketball superiority in Rhode Island runs through Kingston.